PDFs have become the universal document Adobe hoped they'd be and they have some big advantages; you get the look of the document complete with fonts and images, on any computer - just like a piece of paper. PDFs have become the universal document Adobe hoped they'd be and they have some big advantages; you get the look of the document complete with fonts and images, on any computer - just like a piece of paper. Also like a piece of paper, PDFs are a pain to work with when you want to do more than just read them; hard to update without recreating them from scratch, hard to copy information out of (which may be what you want for something confidential but probably isn't for a white paper or sales brochure) and surprisingly hard to make. Adobe Acrobat Professional is powerful but unwieldy; I regularly create, proof and comment on multi-page PDFs and for every feature I appreciate there's one that has me tearing my hair out. Nuance's new PDF Converter 7 claims to be cheaper (£99 plus VAT) and easier to use, with tools for creating, editing and converting PDFs. The PDF Converter Assistant uses OCR to convert PDFs back into Office documents (in Word, WordPerfect, Excel, PowerPoint or RTF formats. You can preview the pages and pick which ones you want; it's nice to see icons for this (power users can fill in the same powerful but confusing-for-some regular expressions as Print dialogs like 2-6, 8-10, 12, 32-40) but they're far too small and hard to read compared to the big friendly buttons at the top of the dialog. Integration with SharePoint lets you convert PDFs and send them to a SharePoint library (if the original PDF is there, the converter puts the new document in the same folder). Conversion is fast (less than a minute for a 42-page document) and very accurate; the only spelling error was two words concatenated at the end of a line and images, tables, text boxes and other layout elements reflect the original PDF layout - but in a document you can edit. This is very useful for updating a document you no longer have the original for, converting a brochure into a presentation - or getting information from online banking sites that only offer statements as PDFs into a spreadsheet. If the PDF is locked, you'll still need the password to work with it. There's a toolbar for IE, Firefox and Chrome that lets you convert PDFs on the Web to Word or Excel. The PDF Create Assistant for creating PDFs is broadly similar to the equivalent Adobe tool, although without the helpful layout tool for how multiple files should appear (and the first page of our PDF was an explanatory page that doubles as an advert for the PDF Converter software). What's more useful is the integration with Office apps for creating PDFS directly. 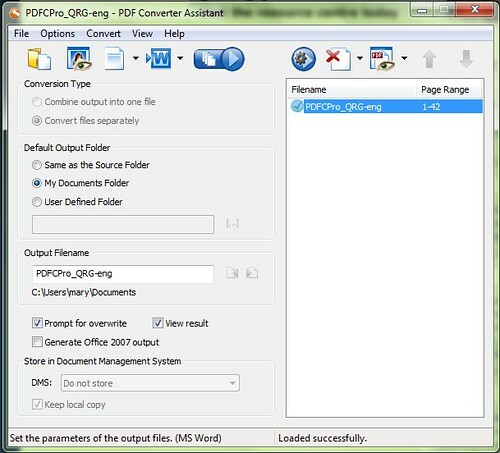 In Outlook or Lotus Notes you can convert attachments you send to PDF when you add them to your message or save incoming attachments as PDFs individually or automatically. If you're turning Word documents into PDF, you can pick paragraph styles that should be converted to bookmarks in the PDF (which can create an automatic table of contents) and choose whether to include comments and metadata or not. The main PDF Converter Professional app corresponds to Acrobat Professional but has some useful extras. The FormTyper will look for fields in a PDF and turn them into fields you can fill in, though it needs fields that are marked fairly clearly on the form. You can 'flatten' PDFs with comments and annotations to make sure these aren't accidentally moved or changed. The side-by-side comparison is useful for checking comments and changes - and you can also compare a PDF with a Word file (the original or the converted version you've made). The Looks-Like Search can find text that looks like a date, email address, credit card number, phone numbers (although it only seems to find US formatted numbers) and social security numbers (again, only useful for US formats). You can add your own Looks-Like patterns of letters, numbers and specific characters (but UK software should really come with UK versions of phone numbers and NI numbers). One very unusual feature reads PDF files aloud to you in an obviously synthetic but very understandable voice (using Nuance's RealSpeak engine); this is an interesting option for reviewing documents that we haven't seen elsewhere.